Attention parents! Do you let your child use your cell phone? Do you allow your child to spend long hours playing with your gadgets? If yes, then you may have to think twice before giving your phone to your child now. Doctors in the UK have warned that children are increasingly finding it hard to hold pens and pencils because of excessive use of technology – such as phones and tablets. According to them, excessive use of touchscreen phones and tablets is preventing children’s finger muscles from developing sufficiently to enable them to hold a pencil correctly. “Children are not coming into school with the hand strength and dexterity they had 10 years ago,” said Sally Payne, the head pediatric therapist at the Heart of England Foundation NHS Trust in the UK. “Children coming into school are being given a pencil but are increasingly not be able to hold it because they do not have the fundamental movement skills. To be able to grip a pencil and move it, you need strong control of the fine muscles in your fingers. Children need lots of opportunities to develop those skills,” said Payne. “It’s easier to give a child an iPad than encouraging them to do muscle-building play such as building blocks, cutting and sticking, or pulling toys and ropes,” Payne was quoted as saying by the Guardian. 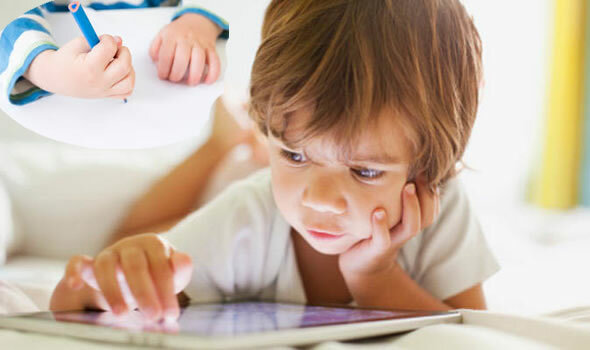 Mellissa Prunty, who runs a research clinic at Brunel University London investigating key skills in childhood, including handwriting, said that increasing numbers of children may be developing handwriting late because of an overuse of technology. “One problem is that handwriting is very individual in how it develops in each child. Without research, the risk is that we make too many assumptions about why a child isn’t able to write at the expected age and don’t intervene when there is a technology-related cause,” said Prunty. Although the early years’ curriculum has handwriting targets for every year, different primary schools focus on handwriting in different ways – with some using tablets alongside pencils, Prunty added. This becomes a problem when the same children also spend large periods of time on tablets outside the school. With technology becoming a widespread phenomenon in the present time, it is affecting not just the adults but kids too. A number of studies have shown that the radiation emitted by mobile phones and mobile phone masts can have adverse effects on children. In fact, the World Health Organisation (WHO) has classified cell phone radiation as ‘possibly carcinogenic to humans’. As parents, you must take preventive measures to minimize your child’s exposure to the harmful effects of mobile phones. Next article Rats Prove Regulatory Agencies Are In Denial Over Cell Phone Radiation - Again!